It’s that time of year! A $399 seven-day Caribbean cruise may sound like a bargain, but know this: the price is really only the point of entry. As ships have become fancier and offer more amenities than ever before, trying to figure out how much your trip will cost is a little bit like peering into Alice in Wonderland’s rabbit hole: There’s no one answer. From bargain-hunting cruise fares to restraining onboard expenditures, we’re here to offer top tips for getting the best value for your cruise vacation budget. Never Pay the Brochure Price – We repeat: Never. Cruise lines all issue gorgeous, glossy brochures with “sample” pricing, but unless it’s a very special (and very well-sold) trip where demand is higher than supply – which is incredibly rare- consider those prices to be about as accurate as those per-day hotel rates posted on the back of your room’s door. Cruise Close to Home – Cruise lines have embraced “homeland cruising,” which translates to establishing home ports in cities all along the U.S. coast. The primary benefit? No need to tack on the cost of an airline ticket to more traditional send-off port cities, like Miami, Ft. Lauderdale and San Juan. Do plan, however, to pay $10 a day to park your car in port garages. Cruise For Free – Convince a group of friends to cruise together, and you can go for free! Many cruise lines reward “group planners” who organize a trip of at least 16 people (two to a cabin) with a free cruise. Those who are extra popular and coordinate a minimum of 32 people (in 16 cabins) may nab a free cabin for two. 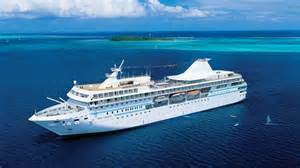 Shore Excursions – Cruise lines offer a variety of shore excursions in every port of call they visit. The main advantage to booking the cruise line’s own tours is that, ideally, the ship will stand behind its quality (and if the tour runs late the ship will wait). On the other hand, they tend to cost more, often involve fairly large groups, and the extremely popular tours can sell out quickly. One alternative: independent shore excursion specialists book similar or better day-trips at ports of call for the same or less money. Cruises are an ideal vacation for anyone looking to get away and experience the extraordinary. If you have any favorite cruise memories or tips on how to cruise affordably, share with us below!